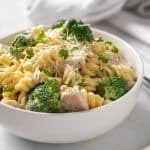 This easy Chicken and Broccoli Alfredo is creamy, comforting and on the table in just 30 minutes from start to finish! This recipe is nothing short of comfort in a bowl. Not only is it quick and simple, the cleanup is fairly easy, too. 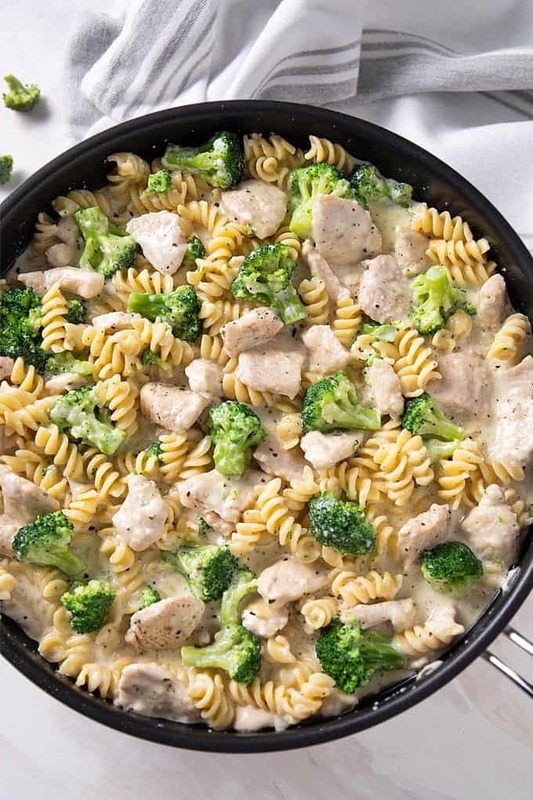 All you’ll need is a skillet for the chicken and Alfredo sauce and a pot for the pasta and broccoli. 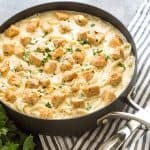 This has the perfect amount of Alfredo sauce – not too dry and not too soupy… just right! Can any leftovers be reheated? 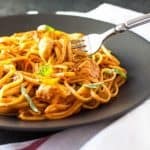 Yes, this reheats very well and the leftovers are delicious (if you have any leftovers!). 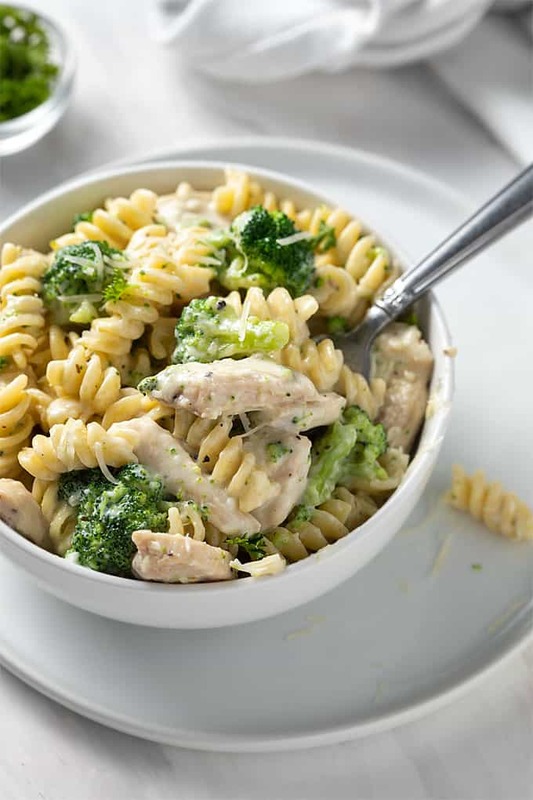 When refrigerating leftovers, the pasta will absorb some of the moisture in the sauce (and the sauce will thicken), so I recommend adding some milk when reheating until your desired consistency of the sauce is met. I typically eat this as a complete meal because it has starch, protein, dairy and a vegetable. 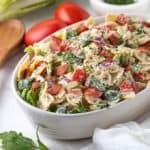 If you want to spread out the number of servings, serve it with a garden salad and garlic bread. I measured this recipe to be approximately 9 cups, so this serves 4 generous (2-1/4 cup) servings or 6 (1-1/2 cup) servings. 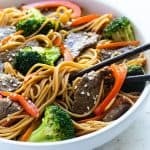 Can I use frozen broccoli instead of fresh? Yes! 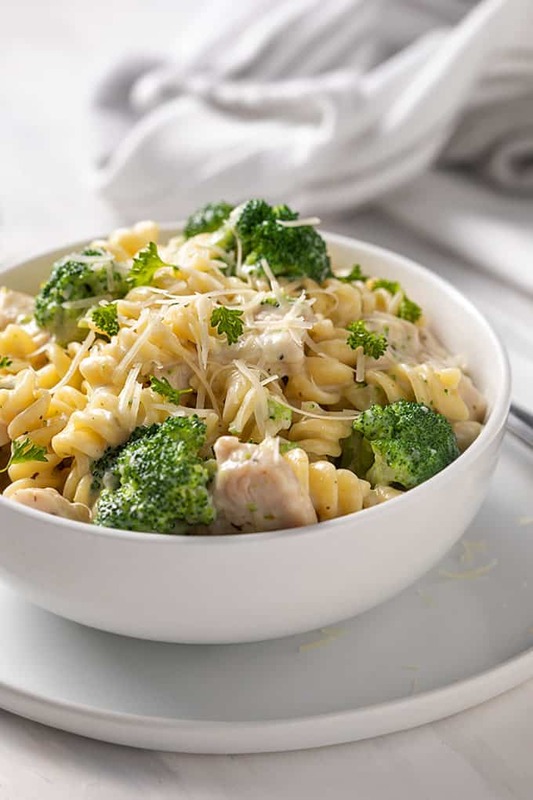 Frozen broccoli works in this recipe as well. Cook pasta according to package directions. Add broccoli florets during the last 4 minutes of cook time. Drain well. While pasta is cooking, season chicken with salt and pepper. Melt 1 tablespoon of butter in a large skillet over medium high heat (I used a 12-inch skillet). 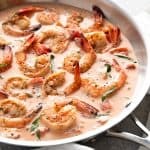 Add chicken and cook for approximately 6-7 minutes (3 to 3-1/2 minutes on each side), or until chicken is no longer pink and fully cooked. Transfer chicken to a plate and set aside. In the same skillet over medium heat, melt the remaining 1/3 cup of butter. Add garlic and sauté (stirring constantly), until fragrant (about 30 seconds). Add cream cheese cubes and Italian seasoning. Whisk to smooth out any large lumps. Slowly pour in milk, about 1/4 cup at a time, while continuing to whisk. Add Parmesan cheese and whisk or stir well to combine. Continue to cook and stir for 2-3 minutes, or until sauce reaches desired thickness. 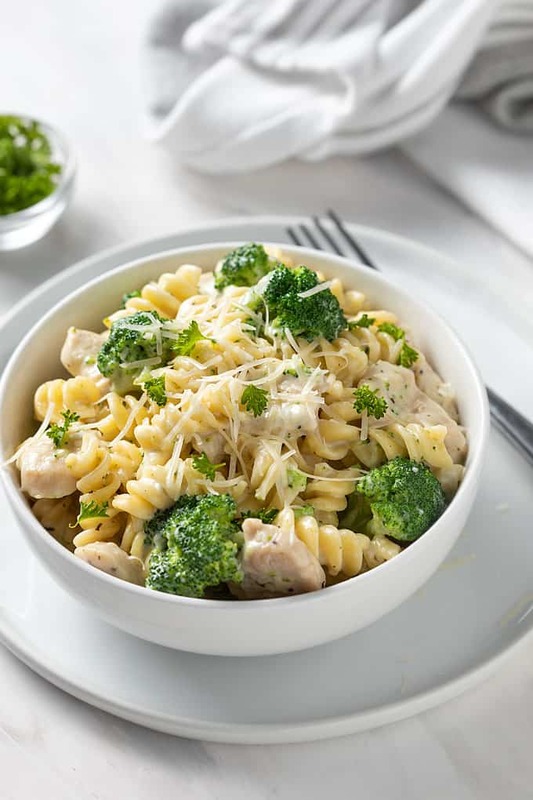 Remove from heat and add pasta, broccoli and cooked chicken to skillet with sauce. Toss to coat evenly. Season with additional salt and pepper, if desired. 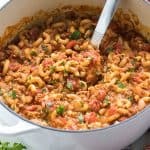 Serve sprinkled with shredded Parmesan cheese and fresh chopped parsley, if desired. If reheating and sauce is too thick, add milk to reach desired consistency.